Time, sun damage, skin disease and trauma all take their toll upon our skin, leaving irregular pigmentation, scarring, wrinkles, and sallow or cloudy complexions. There are several stages of resurfacing the skin which can improve its quality. The treatment of these conditions always begins with attention to any underlying medical cause. Once this is under control surgical options for improving the aftermath are available. Resurfacing techniques are most commonly used. All of these techniques have their limitations, risks and periods of cosmetic disability. In most cases the rewards are substantial. Normally the more aggressive resurfacing options offer the greatest likelihood of improvement. On the other hand, more aggressive options are accompanied by longer periods of recovery. The laser treatment you carried out on my face was very successful and makes me look so much younger that my wife is beginning to worry. Thanks for your kind attentions. -A.S.
Dear Dr. Nakatsui, I’m so pleased with my laser resurfacing. I really appreciate what you have done for me. I look so much better and I’m very glad I had it done. Thanks so much. Thanks also to your staff. Everyone was so helpful and nice. I appreciate the wonderful care I was given by everyone. – M.B. Microdermabrasion is a form of skin polishing which lifts superficial dead skin, loosens blackheads and drains whiteheads resulting in a smoother skin texture and a more even color. A microdermabrasion is beneficial to people with dull, dry, rough skin, acne prone or oily skin and mild acne scarring. A number of sessions are required before improvement is noted. The period of recovery after a treatment is usually minimal. Most people have some redness after a treatment, much like they have a light sunburn. 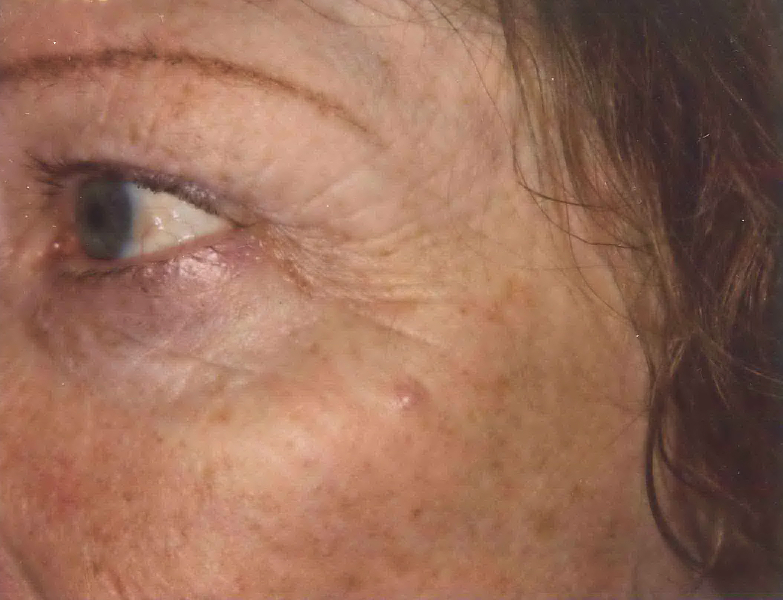 With any resurfacing technique there is a potential for scar, infection and irregular pigmentation, although this would be rare. Description: Laser stimulation of the deeper layers of the skin with the Laser Genesis while leaving the superficial epidermis intact. Often combined with medicated creams, microdermabrasions and if indicated the Titan to achieve synergistic benefits. Average Cost: $300.00 per treatment. Length of Procedure: 30 minutes. Recovery Time: None, although skin may be slightly pink or red for a few hours after treatment. Treatment Frequency: Six treatments over a period of six weeks. Risks: Irritation, irregular pigmentation, persistent redness, possible wounds and scarring if performed incorrectly. Duration of Results: Temporary, but results normally continue to improve with repeated treatment. Sun protection is essential to maintain results. The Pearl procedure combines the impact of resurfacing lasers with the gentleness and safety of non-invasive procedures to treat aging and sun damaged skin. The Pearl is particularly effective at evening out brown discoloration in the skin caused by solar damage as well as reducing wrinkles and evening out texture. During the procedure, the top layer of the skin is treated with pulses of light in a pre-selected pattern. The laser simultaneously sends heat to the deeper layers of the skin to provide longer term benefits. The semi-ablative treatment provides a natural protective dressing over the skin to minimize downtime during the restorative process. Four to five days after the treatment the natural dressing tends to slough off leaving new, healthy, vibrant skin underneath. Description: Laser light is used to restructure layers of skin, improving fine wrinkles and scars. Often combined with Pearl to address uneven pigmentation. Length of Procedure: One hour. Recovery Time: Normally return to work in five days. Risks: Burns, scarring, pigmentation changes, infection, persistent redness, activation of herpes virus infections (cold sores) around the mouth. Duration of Results: Results and duration of improvement vary. Aging and sun exposure can affect results. The Pearl Fractional is a recent advancement in the resurfacing treatments available for the treatment of wrinkles and texture changes in the skin. Laser pulses place tiny holes deep in the skin selectively removing columns of damaged tissue leaving the surrounding skin intact. Patients see an improvement in photo damage, tone and texture as well as a noticeably smoother brighter complexion. The Pearl Fractional is often combined with the Pearl to achieve maximum benefit (Pearl Fusion). 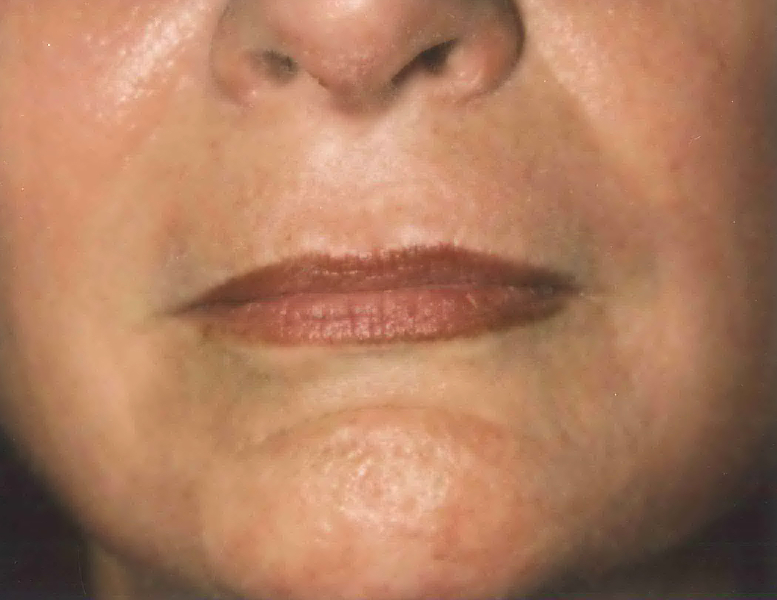 The photo below shows one of our patients after one treatment with Pearl Fusion. Additional benefit can be seen with more treatments. **Actual patient. Individual results may vary. Recovery Time: Return to work in five days. Duration of Results: Results and duration of improvement vary. Aging and sun exposure will affect results. 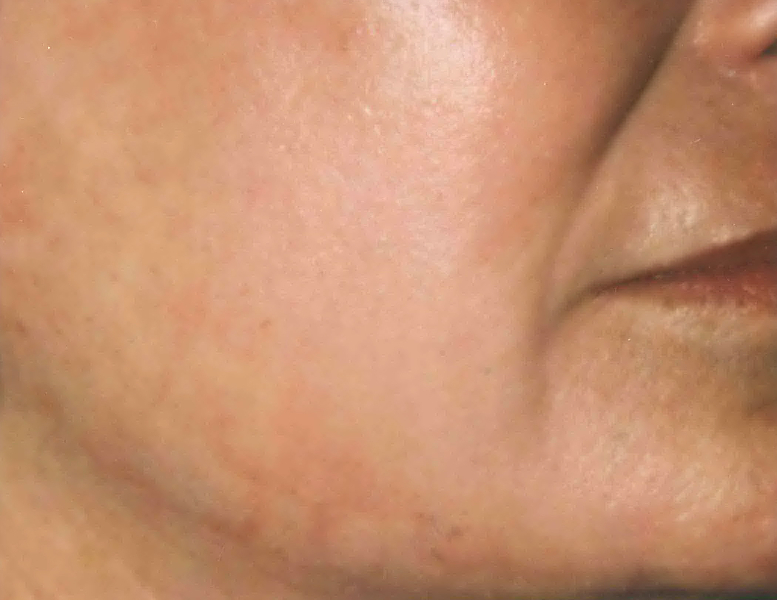 Patients with advanced sun damage of their skin and severe scarring do best with the carbon dioxide fractional laser resurfacing technique. In this case the surgeon has a great deal of control in the removal of wrinkles and evening out pigment and texture changes. The results can be very dramatic. The post operative recovery time is about fourteen to twenty-one days. During this healing period people must avoid sun exposure because the skin is quite sensitive. 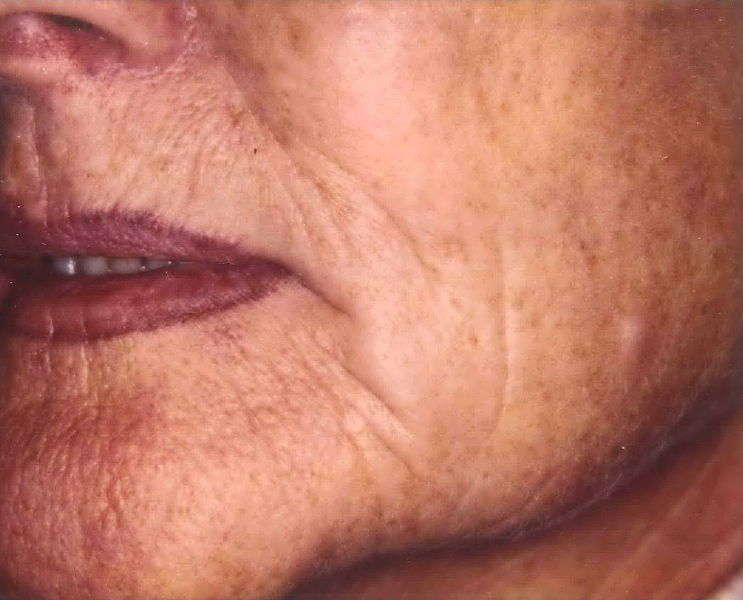 Ablative laser resurfacing is the most advanced care for severely damaged skin (texture changes, irregular pigmentation, deep wrinkles), and scars. We use the ActiveFX and DeepFX laser systems for our patients. 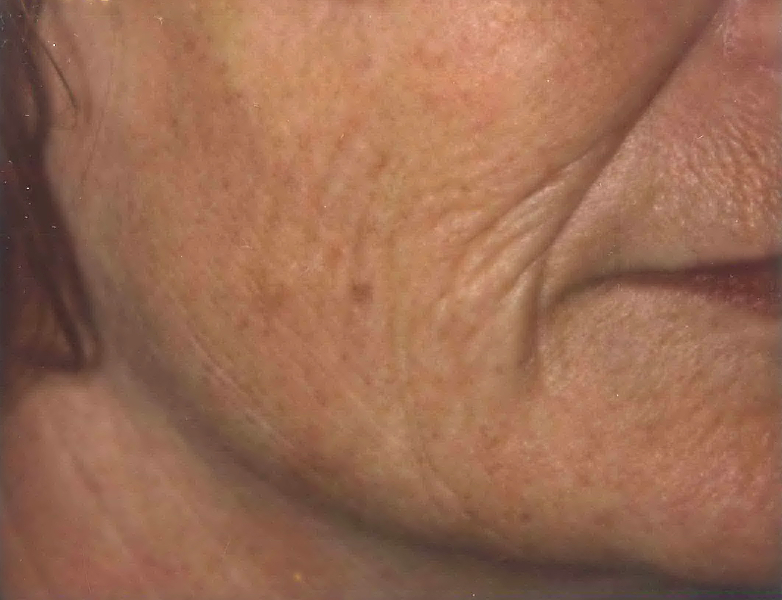 Although similar to devices such as Fraxel, ActiveFX and DeepFX carbon dioxide fractional laser techniques are more aggressive and require more downtime and recovery. On the other hand, they also provide more improvement over these less aggressive therapies. Description: ActiveFX and DeepFX carbon dioxide fractional laser is used to remove the upper layers of the skin and reach into the dermis to improve scars, fine lines and wrinkles and to treat irregular pigmentation. Length of Procedure: 30 minutes to an hour and a half. Recovery Time: Return to work within two weeks. Treatment Frequency: May be repeated if necessary. Risks: Burns, scarring, pigmentation changes, persistent redness, infection, activation of herpes virus infections (cold sores). Duration of Results: Normally long-lasting, but aging will affect results. Sun protection is essential to maintain results. The above treatment options achieve quality improvement of the skin. 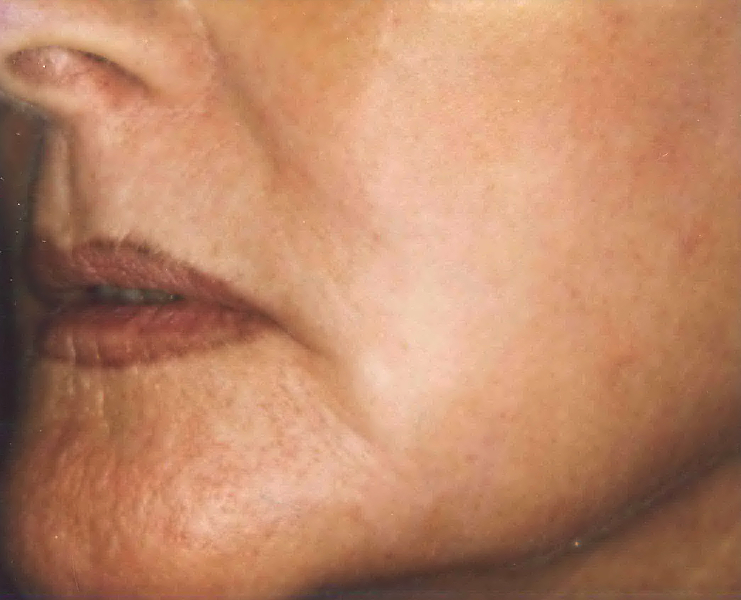 In the early stages of gravity pull, nonsurgical skin tightening using the Titan can be helpful. 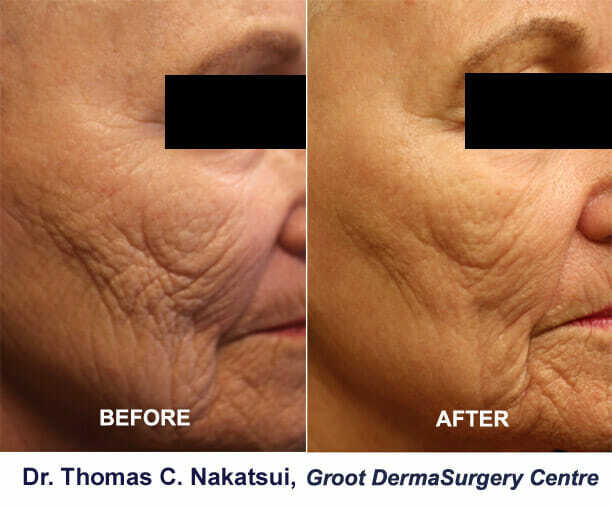 Gravity changes which result in redundant skin require re-draping surgical procedures and deep muscle pull creases require Botox or dermal fillers. 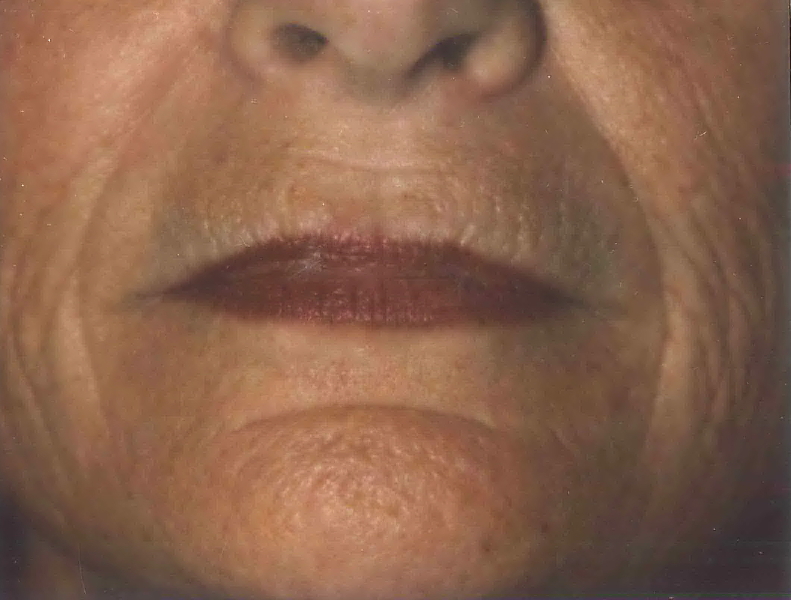 Facial veins and deep pigmented lesions require treatment with target specific lasers. Many patients start with the milder treatments and eventually move on to the more effective, aggressive treatments for aging changes. One treatment does not preclude the use of others. 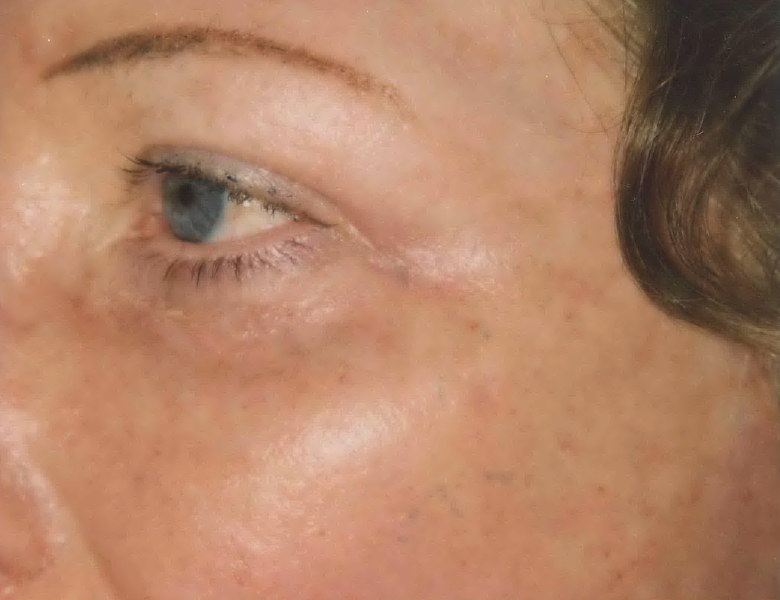 Many patients begin with medicated creams, then move through the spectrum of microdermabrasions, non-ablative and semi-ablative laser resurfacing and then on to ablative laser resurfacing at a later date as aging changes continue to progress. Some choose the synergistic benefits of combined therapies such as the 3D Rejuvenation Program. Others are happy to stay with the least aggressive options. What might be good for one person may not be good for another or may not be good at a certain period of time in their life. Whatever treatment is chosen, it’s important to reflect on the procedure, alternatives, risks and limitations, and the experience of the surgeon.